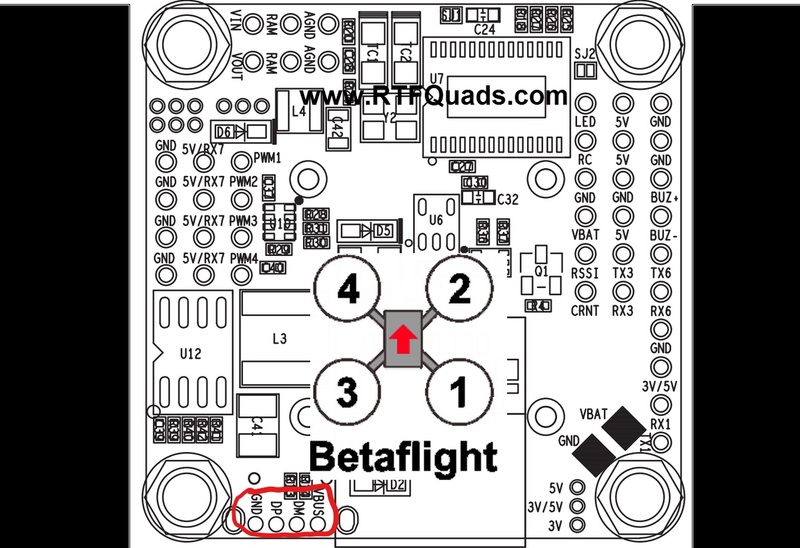 This is a complete newb question, but how do I set up a betaflight receiver for PPM? I have the signal cable in the proper ppm/sbus port, and I have set the receiver mode to PPM Rx in the betaflight configurator. I still can't get it to work. Are there any steps I am missing? I am using a FLIP 32 F7 Omnibus V2 fcb. Also, in the future, you can keep replying with new questions in your old thread. You don&#8217;t need to create a new thread. Actually, only serial receivers like SBUS and Spektrum satellite need to have a UART set up. Thanks, Sean. That&#8217;s what I had initially typed up, then I got caught thinking that PPM one wire was serial. Thanks, Sean. That’s what I had initially typed up, then I got caught thinking that PPM one wire was serial. Iondriver - There should be a jumper near the SBUS/PPM pins to let you select SBUS or PPM, make sure it's set to PPM. Ok, thanks everyone for the info! This is my first build, and I ended up with an fcb that didn't have very good documentation or labeling. I think I found the sbus/ppm jumper, but I would like to make sure. Is it the part I circled in red at the bottom of the picture? If it is, what parts do I jump? I think what you&#8217;ve circled in red are the USB pads. I wouldn&#8217;t jumper those. Teralift on RCGroups is the Omnibus guru. This post by him suggests that the F7 V2 may not have PPM. I hope that’s not the case. I just sent him a private message over there. What transmitter/receiver are you using? I really hope that is not the case. If it is, it looks like I will need to get a PWM harness. I am using an FrSky i6S, I believe. I will double check as soon as I get the chance. I know it is a 6 channel FrSky receiver with telemetry, and a combo ppm/channel 1 port. Does your receiver have ibus on the top? If so, that may work. I do! I now have the receiver hooked up, and it works properly in the beta flight configurator. Also, is there a way to change which channel is the throttle? Thank you for everything French, I greatly appreciate it! Edit: I forgot to mention that I have tried to adjust the channel mapping using the menu in the transmitter. Right now the throttle is set to left/right motion on the stick, but I would like it to be up/down. TAER means - Throttle on channel 1, Aelieron (roll) on channel 2, Elevator (pitch) on channel 3, and Rudder (yaw) on channel 3. You can change that drop down until everything is right on the screen. One more question. When I test the motors using the Betaflight configurator, my ESC arms properly. When I try testing the motors using the transmitter, the esc doesn't arm. I get the first three beeps from it, and that is it. Do you have any idea what could be causing it? I am using a RacerStar 4-in-1 ESC with BLHeli. Here is what I have configured for the ESC's so far. My receiver has a self centering throttle. Could this be causing it? My receiver has a self centering throttle. Could this be causing it? Yup, when you boot your ESC at some point higher than 1000ms (zero throttle) it goes into programming mode. You should probably ditch that throttle centering spring, I can see it causing huge problems other than this. Ok, that is kinda what I figured. I was planning on getting there eventually, but it seems like it is more of a priority now. Thank you! Ok, so the self centering throttle wasn&#8217;t the only issue apparently. I successfully removed the offending spring, and the throttle responds correctly on the configurator. However, I am still having the same issue. What are the typical causes of this problem? *My PID settings are default. *I have the default QUADX motor mix. *The accelerometer is correctly calibrated. 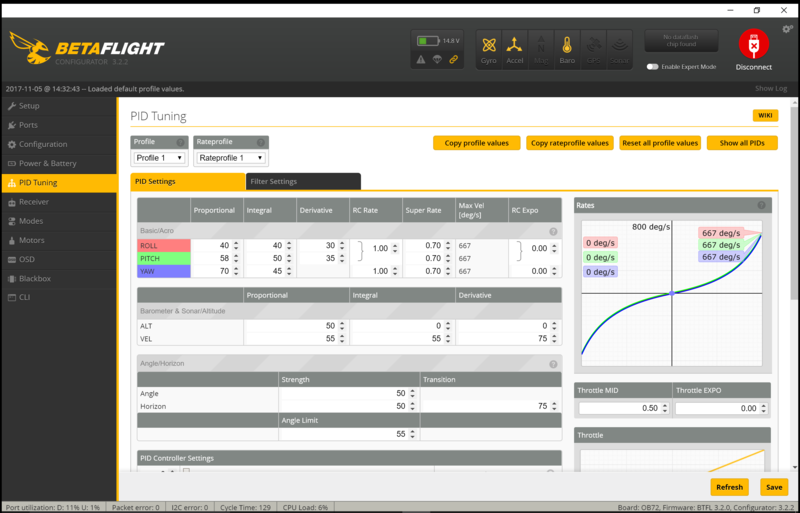 I have attached a picture of my current PID settings which are the default for beta flight. Does anyone have any ideas as to other possible causes? 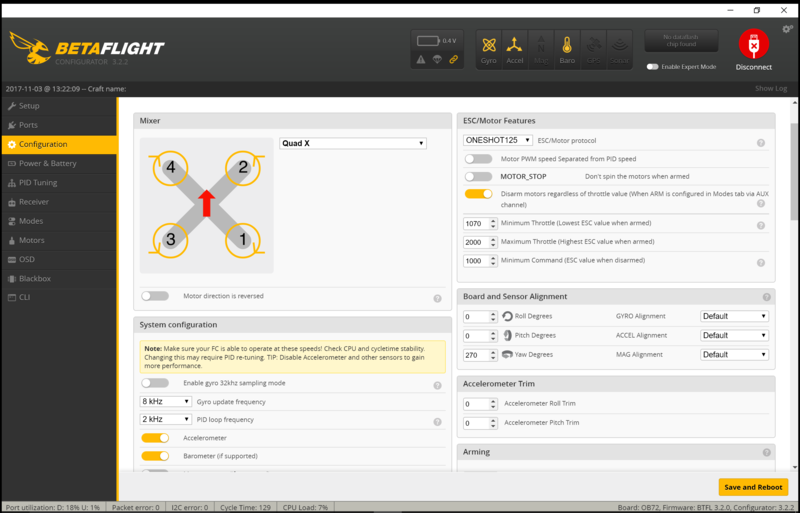 When you go to the Setup Tab and move the quad around, does the quad on the screen correspond to your movements? Pitch forward, pitch back, roll right, roll left, yaw (spin) left, yaw right? Yes it does. Everything lines up and reacts properly.